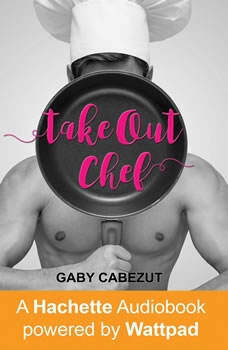 TAKE OUT CHEF is a new release from Hachette Audiobooks: Powered by Wattpad - an innovative collaboration between Hachette Book Group, a leading publisher, and Wattpad, a passionate storytelling community of over 45 million people. Your favorite online stories, now available in your headphones!Jessica Summers works all day to support her family. Her social life consists of having dinner in front of the television watching Chef Tom's magical hands prepare foods. Being a chef is her lifelong dream, but since her mom passed away, being there for her brother and helping ease the burden for her quirky grandmother are her priority.Her life takes an unexpected turn when her brother signs her up in an experimental program to help young delinquents. Chef Tom Simmons and chef Bryan Sullen head the project, and when they meet, Jessie is hoping to get a spot in the school -despite her non-criminal record- not to find a new job. Yet, Tom is in desperate need of a new assistant, and Jessie is the perfect fit. Bryan has a rough faA§ade. He's obnoxious and bossy, but shows moments of kindness too. Their romance blossoms between remaking messy soufflA©s and baking crispy croissants. When they have plans to start dating, Bryan has an emergency and shuts down on Jessie. When Bryan comes back, Jesse must decide to follow her heart and give the man she loves a chance to open up, or let him go for good.